Amie Kaufman and Meagan Spooner, together and separately have been staking out the science fiction corner of the young teen, young adult market. In the Illluminae Files, together with Jay Kristoff, Kaufman showed a willingness to recycle tried and tested science fiction tropes into a new format. 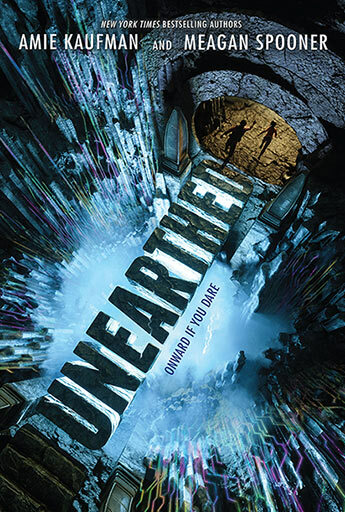 Unearthed is a similar sort of hybrid – part Indiana Jones, part Tomb Raider, part Contact, part Arrival and part, well every science fiction novel that has humans exploring strange new worlds (with a dystopian back story that also involves a generation ship for good measure). And in the middle of it, two snarky, flirty, intelligent, likeable teens from opposite sides of the tracks who fall for each other while saving the day. An alien signal from a race called the Undying has opened the way to a barren planet called Gaia which contains potentially world-changing technology. Amelia is a sixteen-year-old scavenger who has gone to Gaia to find her fortune and Jules, slightly older, is a genius academic who wants to solve the riddle of the alien tombs. They meet cute and are forced to travel together. And while their attraction grows, they have to navigate a tomb by solving alien puzzles, avoid bad guys and discover the ultimate secrets of Gaia and the Undying. While there is nothing particularly original here there is plenty to like about Unearthed and it will particularly appeal to its target reading audience. The main characters are teens to aspire to and the action, twists and cliffhangers are relentless. Unearthed is designed to be a page turner which allows readers to brush through the plot holes and the logic, which is sometimes hard to follow. The ending is one massive wtf cliffhanger, which poses more questions than it answers but promises a sequel that should be very different.